Rhonda Faehn, the former senior vice president of USA Gymnastics, said she first reported an allegation against Nassar to Steve Penny, her then-boss, on June 17, 2015. Nassar was not arrested until more than a year later. 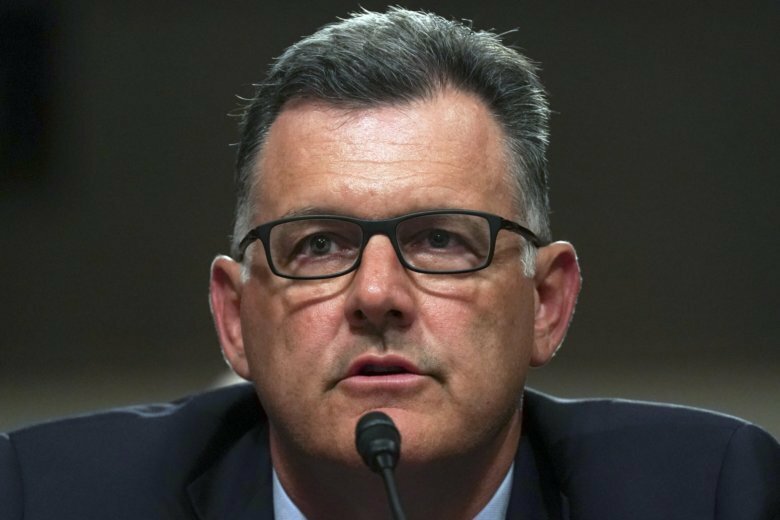 WASHINGTON (AP) — The former president of USA Gymnastics refused to answer questions Tuesday from a Senate subcommittee about how he handled allegations of sexual abuse by former team doctor Larry Nassar, and another former executive sat next to him and asserted that her former boss instructed her and others to keep quiet about athletes’ claims. Faehn reiterated those claims as Penny, who was forced out as president of USA Gymnastics last year, sat silently next to her. When it was his turn to speak, he didn’t say much. Penny invoked his Fifth Amendment right against self-incrimination six times before he was excused by the panel. As he slowly limped out of the hearing room, former gymnast Amy Moran shouted “Shame!” in his direction. Moran alleges she was abused by her former coach and reported it to Penny, and she was unsatisfied with Penny’s response to the allegations, which she now sees as a precursor to how he handled the Nassar case. Penny was subpoenaed to appear before the committee. Senators questioned him on when he found out about the abuse allegations and why he waited to inform law enforcement or Nassar’s employer, Michigan State University. Faehn broke into tears as she described the actions she took in an effort to protect Nassar’s victims. But victims who attended the hearing said they were disappointed she didn’t do more. “You just see all these little people thinking they did their thing, but no one took the one step that should have been taken, which is go to the police, or the authorities. The one thing one person could have done is do that. No one did that,” said former gymnast Emily Stebbins, who alleges she was abused by Nassar the first time he examined her as a teenager. The subcommittee chairman, Republican Sen. Jerry Moran of Kansas, and other senators pledged to continue their work toward reform of U.S. Olympic sports’ governing bodies.